Call 605-689-0500 or text 605-661-8906 to schedule your group! *A minimum purchase may be required for a private party. Thank you for planning ahead! 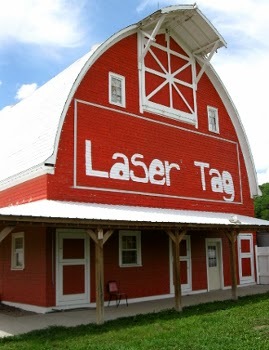 Laser Barn, located just west of Yankton, SD, is your one-stop for fun, games, and food, year-round! We feature indoor and outdoor laser tag, arcade games, and a variety of mouth-watering menu items, including our famous 52" pizza which is always served hot and fresh! Laser Barn is an excellent choice for birthday parties, special occasions, company gatherings, or just a day of fun! Every day is a special occasion, and our family-friendly environment is the ideal place to make lasting memories any time of the year. We have party packages for any celebration, including mobile laser tag options, making Laser Barn an affordable and flexible option for hosting a memorable event. Both walk-ins and reservations are welcome; however, reservations for larger groups (8+) are encouraged so we can better accommodate your group's needs. Check out our party packages and other money-saving deals! Please call or visit us to arrange your day of fun!